Smackdown: When Will "Then" Be "Now"? So for our last anniversary, we did the tasting menu at Aureole instead of going to Le Bernadin. (It was BANANAS, and I ate and ate and didn’t take any pictures or notes or anything and it was LUXURIOUS.) And for our next anniversary, I’m probably going to try and convince Brian to go to Eleven Madison Park instead of going to Le Bernadin. “My wife made me go to Eleven Madison Park instead of Le Bernadin” = the ultimate in first-world complaints. It’s actually kinda beyond the pale, and I suppose it can’t really even be properly termed a “complaint.” Like, “I really wanted a new Audi, but my wife made us get this stupid Mercedes.” Have we turned into people you want to smack? I fear we have. One day, we WILL get to Le Bernadin because Brian, ever the good Jew, loves nothing more than a nice piece of fish. Until that day, we have the Le Bernardin Cookbook , so I can pretend to be Teutonic-Zombie-Who-Might-Actually-Be-Hot-But-I’m-Not-Sure Eric Ripert in my very own kitchen. 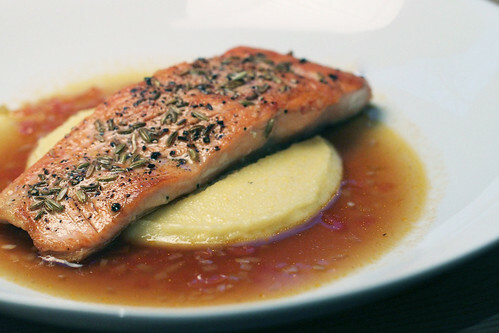 Tonight’s Ripert-ism: fennel and black pepper crusted salmon with shallot-madiera sauce and white truffle polenta. I know, right? And this is one of the EASY recipes. 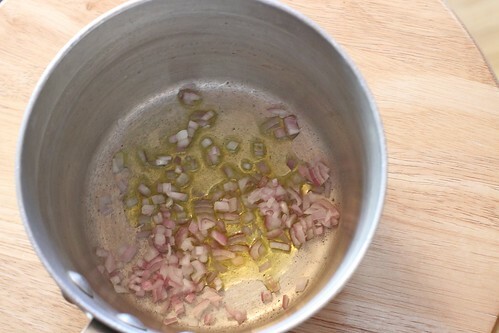 The sauce started with minced shallots sauteed in a bit of oil; diced tomato and minced garlic went in next, followed by madiera and, eventually, veal stock. Which seems like a bit of an odd pairing for seafood – the smell made me want mushrooms and beef – but you know who I am not? Eric Ripert. I left the whole mess to simmer while I put together the rest of the meal. Excuse me – fennel burp. 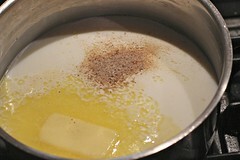 I whisked in some quick-cooking polenta, and when it was nice and thick, added the white truffle oil. An entire tablespoon, which was a goodly portion of the tiny bottle I’d purchased because I am cheap. 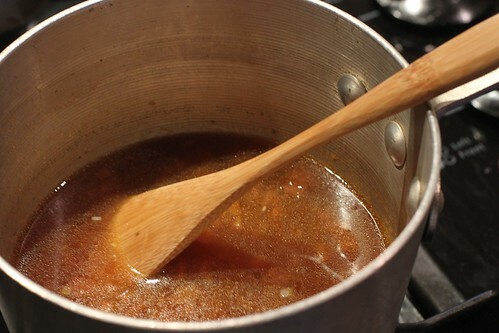 Pouring an entire tablespoon of truffle oil into a hot pot of polenta is like lighting a dozen giant truffle-scented candles in your kitchen. If they made truffle-scented candles, which they would if they knew what was good for ’em. I covered the polenta and set it aside, checked the seasoning on my sauce and retrieved my fennel- and pepper-crusted salmon from the fridge; it got a quick sear in a hot pan. 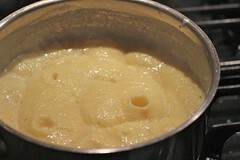 Polenta into a ring mold, spoon sauce around the plate, place salmon on top, ring the dinner bell. We had a difference of opinion on this dinner. Brian found it to be mind-blowing and declared that he would pay $30 to $40 for it in a restaurant, whereas I simply found it to be very, very good and would not pay more than $20. I WANTED it to be mind-blowing – after all, we’re talking about Le Bernadin here – but it didn’t quite rise to that level; Brian helpfully suggested that perhaps it was too subtle for my mind and palate to comprehend. And hey, he could be right. It IS subtle, surprisingly so given the fairly bold flavors involved – fennel, truffle, veal stock. The sauce is actually quite delicate and mixes beautifully with the rich polenta, and the fennel seeds give the dish needed brightness and crunch. It looked great on the plate. “Teutonic-Zombie-Who-Might-Actually-Be-Hot-But-I’m-Not-Sure Eric Ripert” Hee! I have the exact same debate with myself every time he shows up on Top Chef or on Bourdain’s show. I just can’t decide if I think he’s hot or not. One thing I do know though: truffle polenta = hot! That is a delicous looking and sounding plate of food. Found myself chuckling through the whole post, which is pretty much why I read your stuff, that and so I don’t have to come up with my own nicknames for Top Chef-ers. Oh, and much love for the Spaceballs intro line. Everyone says he’s hot, but I think he’s creepy looking. His lips, mostly. I love those surface-of-Mars craters that happen in a pot of cooking polenta. But my husband does not like polenta, so I don’t get to enjoy them very often. Boo. i’d have to try the polenta, it sounds delicious. the rest, i’m sorry to say, i wouldn’t be much interested in. i don’t do veal (not flavourful enough and way too expensive), detest fennel (really and absolutely) and i’m not wild about salmon. 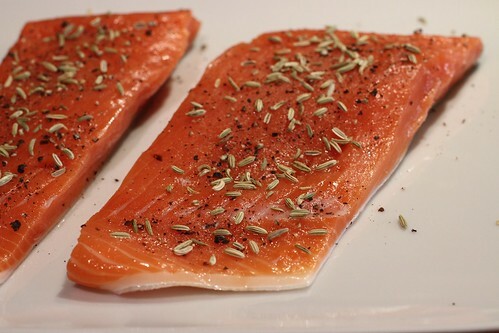 De-lurking to add: this reminds me of a similar salmon thing we make: crust the top of the salmon with a mixture of salt’n’pepa, fennel seeds (ground, crushed, whole, doesn’t matter), orange zest and minced rosemary. We usually have it with the fat couscous, but the polenta sounds delish! Will have to try that sometime. deborah, i think not, but i respect that others think hot. gracie, heh, hooray that you recognized the line! kristie, i mostly come down on the side of “zombie,” but every once in a while, in certain lights, i can see why people are attracted to him. anna, i’m sorry. maybe truffle oil will help? naomi, the polenta is pretty killer. but then, anything with that much white truffle would be. monica, ooh, the orange-fennel combo sounds really good, i’ll have to try that. glad you like the site! Haha. I loved the Spaceballs intro.